Being a rider on an untrained horse is a bit like being out on a rough sea in a small boat - you are getting pushed around by forces much stronger than you are, and you don't really feel in control of the situation. Physically it's not very enjoyable, and mentally you are not at ease either. The following story uses this boat analogy to explore some aspects of the training philosophy of dressage. Imagine you are in the dock with your small boat, having planned a sailing trip. 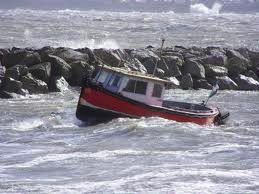 You love sailing, but unfortunately the sea is rough, and doesn't look like it's going to calm down soon. Your friend Ed is also a keen sailor, and has a boat similar to yours, but he doesn't like the look of the rough sea, so he's decided to tie his boat down in the harbor so he can do some improvements on it. So you have a choice: you can either do the same as Ed and call off the trip, or you can head out to sea despite the conditions. You love sailing so much, you decide to take a chance. You untie the boat and leave the safety of the dock for the ocean. Your boat is not really up to the conditions, and navigating is tough to begin with, but you have some tools and materials on board so you decide to start making the little boat stronger and more seaworthy as you go. Since you're out at sea, it's easy to see what could be done to improve things, and you set to work. You've been working away for some time, completely focused on improving the boat, when something magical starts to happen: you notice that the stronger the boat gets, the calmer the sea is getting around you! The weather conditions haven't changed, but soon your boat is in an island of calm, getting pushed around less and less by the waves. Now the sea seems to be supporting instead of threatening you. It becomes so easy to navigate it's almost like you only need to think of it, and the boat changes direction or speed. 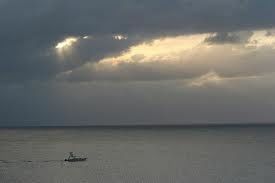 You discover that now you can go wherever you want in your strong little boat on the calm sea. Now you can relax and enjoy the ride, and you have a fantastic trip before eventually returning to the harbor. You come back to find that Ed has also been busy while you were away. While his boat was tied down in the dock, he has made some spectacular renovations - now it's looking more like a yacht with all mod cons! Some friends drop by, and they are impressed by Ed's fancy boat… you have to admit, it certainly looks flashy. 'So what have you been doing all this time?' they ask as they turn to you and glance at your modest but sturdy little boat, for a moment you search for words to describe the amazing journey, then you realize that it's pointless, you can't pass on the experience. You shrug and think to yourself 'all that glitters isn't gold'. To understand this analogy, think of the boat as being your postural structure as a rider, and the sea is the movement of the horse - either unbalanced and threatening like a rough sea, or harmonious and supportive like the calm sea. Ed's boat tied into the harbor is a metaphor for a horse that is held-in and restricted by the bit. 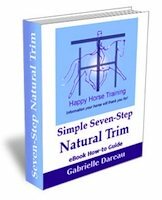 This might seem to be a solution to the problem of the unbalanced forces generated by the untrained horse's movement which act against the rider, and holding the horse like this seems to give you the chance to get down to training him the movements and figures required by the dressage tests (like Ed's impressive renovation work). But the problem is that in reality you're not going anywhere when you ride like this - you haven't left the harbor! To begin to start transforming the horse in a real, functional way, you have to connect yourself to the movement, making yourself stronger as you do it. 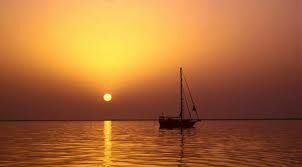 Then the movement which was pushing you out around before starts to become channelled and support you, just like the calm sea and the boat seem to travel together as one. To learn to ride creating the engagement of the horse which brings about this unity, you must relinquish the control of the horse with your reins, and allow your seat, legs and posture to get strong enough to channel the horse - you have to set out to sea if you want to go somewhere! 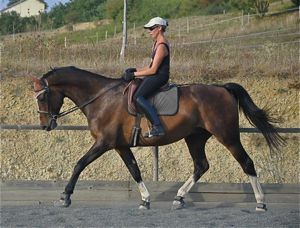 This is one of the major problems with the competitive dressage system: it demands from the most basic level that riders be able to control exactly where the horse is going, at what gait, and when, taking the emphasis off how the horse is going, and rewarding precision that is usually achieved by control with the reins. To train a horse in engagement we must make engagement the priority. 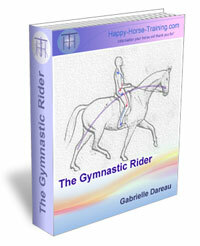 This means that whatever figures, movements and so on that you do in any session are dictated by what the horse needs to improve his engagement, and not by an arbitrary dressage test - that may come afterwards as a confirmation of the level of training, but it should never be the motivation that steers the direction of your training. 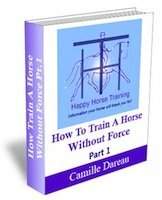 When you follow this correct training philosophy, your result might not look as impressive to the uneducated eye because it will not be founded on the tension that has become a fashionable part of dressage razmataz, but when your horse transforms and becomes part of you in beautiful balanced motion, you will know yourself that you have achieved something miraculous!